Summary: In 1938 Trudi Kanter, stunningly beautiful, chic and charismatic, was a hat designer for the best-dressed women in Vienna. She frequented the most elegant cafés. She had suitors. She flew to Paris to see the latest fashions. And she fell deeply in love with Walter Ehrlich, a charming and romantic businessman. But as Hitler’s tanks rolled into Austria, the world this young Jewish couple knew collapsed, leaving them desperate to escape. In prose that cuts straight to the bone, Some Girls, Some Hats and Hitler tells the true story of Trudi’s astonishing journey from Vienna to Prague to blitzed London seeking safety for her and Walter amid the horror engulfing Europe. It was her courage, resourcefulness and perseverance that kept both her and her beloved safe during the Nazi invasion and that make this an indelible memoir of love and survival. I am always interested in reading about events surrounding World War II, so when I heard about SOME GIRLS, SOME HATS AND HITLER: A TRUE LOVE STORY REDISCOVERED by Trudi Kanter, I definitely wanted to read it. This story about one woman's perseverance to save both herself and her husband is fascinating in its own right; however, the story behind the publication of this book is interesting too. In 2011, an English editor found a secondhand copy of this book which as originally published in 1984 to a small audience; and now the book is being re-released even though the author passed away in 1992. SOME GIRLS, SOME HATS AND HITLER is Trudi Kanter's story that begins in 1938 as Hitler entered Austria. Prior to this, Ms. Kantor had a pretty amazing life. She lived in Vienna near her family and was a successful hat designer. She also had her fair share of friends as well as dates; and she even traveled around Europe for her hat business. While she was in the process of amicably splitting with her first husband, she fell in love with the debonair business man Walter Ehrlich; and she was extremely happy. That is, until Hitler entered the picture and took over Austria. Ms. Kanter believed that, as Jews, she and Walter were at risk; and she was determined to save both of their lives... no matter the cost. It was because of Ms. Kanter's intelligence and perseverance that she was able to save both of them; and her story is a true testament to her love of Walter. I really enjoyed SOME GIRLS, SOME HATS AND HITLER (and I admit that I was a bit worried that I wouldn't after reading Kathy/Bermudaonion's review.) I'm happy to say that I didn't have any issues with the story; and in fact, I read the entire book in just an afternoon because I was so caught up in Ms. Kanter's story. I was pretty sure that I knew how the story would end, so I can't say that I felt as much tension as I would have in a fictional account of World War II. However, I was intrigued by Ms. Kanter's astuteness into the potential threat that Hitler would become, and I was even inspired by her actions. I'm not usually a big fan of romantic stories, but I will say that SOME GIRLS, SOME HATS AND HITLER was a very sweet love story. Ms. Kanter accomplished some pretty remarkable feats (and certainly made her fair share of luck), but I believe it was her love of Walter that gave her the strength to carry on again and again. I was most definitely touched by the power of their love. In addition, I was impressed by Ms. Kanter's account of what was happening all over Europe. She gave an incredibly insightful view into the conditions in Europe, and she didn't mince words. I found it fascinating to read not only what was occurring, but also what she thought might occur. There is no doubt that it was because of Ms. Kanter's intelligence that she acted early enough to save both Walter's and her own life. SOME GIRLS, SOME HATS AND HITLER would make a very interesting book club pick. There is a reading guide available with fifteen thought-provoking questions as well as some suggestions for enhancing your meeting. Some of the themes you might want to discuss include love, marriage, divorce, obligations, war, jealousy, foresight, taking action, fears, new beginnings, feeling like an outsider, and resilience. 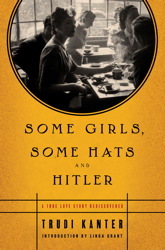 Overall, I recommend SOME GIRLS, SOME HATS AND HITLER to fans of memoirs as well as to those who are interested in the events that took place prior to and during World War II. Thanks to the publisher for providing a review copy of this memoir. I'm glad to read your review as a companion to Kathy's! It's always great to get different perspectives! I enjoyed this book but not as much as you did. I didn't feel Kanter's emotions as I read it and the present tense that was used quite often bothered me. I still think the book is worth reading, though. I guess I didn't realize (or remember, because who remembers?) that this was a true story. They seem to hit me harder than the fictional ones, especially with WWII novels. Having just come off of City of Women, though, I think I need a breather. Too many Nazis. I enjoy true WWII stories better then the fiction, because it makes it more real to me. I feel it's a testament to read the novel for the person's story. Thanks for bringing this to my attention. This sounds right up my alley. I'm not big on romances, though, so glad to see it's a sweet one given the heavy history.